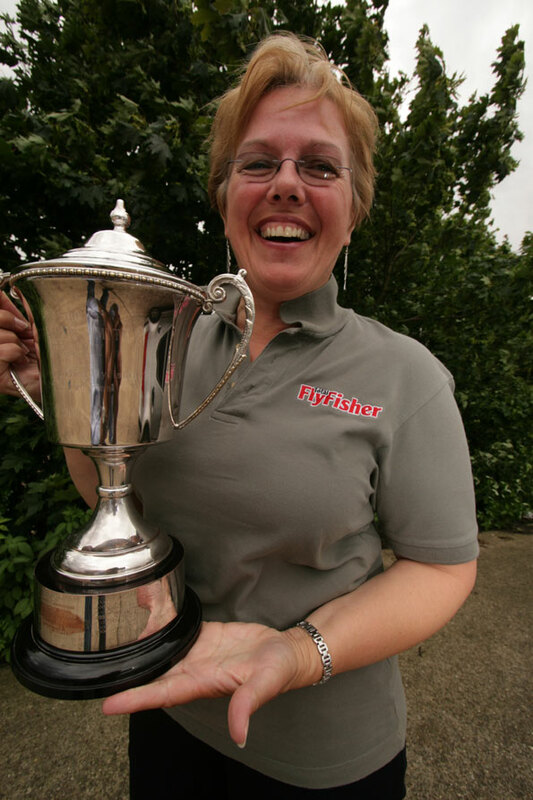 Rugby based Sue Shaw will be fishing in the England fly-fishing team next year after winning the England Ladies Flyfishing Association National held at Rutland Water. With the adverse weather conditions of late the reservoir is as high as anyone can remember, and the fishing has suffered with the average bag on the day just two fish. After a practice day with Curly Dave from the Rutland Fishing Lodge, Sue ventured out with her boat partner Mairi McFarlane feeling quietly confident. The pair motored around until they found some feeding trout and then proceeded to catch them throughout the day – the best area being on the corner of Whitwell Creek. Sue, who works for Daventry based Total Flyfisher magazine, took six quality trout to the scales weighing in at an impressive 13lb 15 7/8oz and that was enough to secure top spot. The main patterns used were blobs and boobies, which were fished on a Sixth Sense Di3 line using 12lb Riverge Fluorocarbon. Mairi also managed to bag four fish which secured fifth place for her. The for Sue means that she will now be part of the England team that will travel to the Lake of Menteith in Scotland in June 2008 for the Home International against Scotland, Ireland and Wales. This will be her 11th England cap and she is looking forward to it immensely: “I have made many friends over the years at the Internationals from all the opposing countries and we always have a great time,” she said. In her spare time Sue is the press officer for the England Ladies Flyfishing Association for whom this year, will see the start of a new project called ‘Casting for Recovery UK & Ireland’ where breast cancer survivors are taken away for a 2.5 day retreat at no cost to themselves. Sue is a qualified GAIA level 2 coach and will be on hand to offer guidance to the participants who will also receive counselling from qualified medical professionals.